Congratulations for second baby: Have any of your friends, family or work colleagues become parents again? Congratulate the couple by sending your best wishes and good luck. Take ideas from this post to write your own delightful congratulatory message which you can send as a sweet text, funny Facebook post, cute pin on Pinterest or as a beautiful quote on a card. Giving birth, becoming a mother and father, and welcoming yet another addition to the family deserves a celebration like no other. Be a part of this happy moment and bless the couple with all your heart for becoming mommy and daddy to a baby boy or a baby girl. 1) A loving and handsome father, caring and beautiful mother, pretty and bubbly daughter, and now a cute son like no other. Congratulations for becoming the perfect family. 2) The best part of having a second child is that no one will try to give you parenting advice because they know you have already done this before. Congratulations. 3) Cupid smiled upon you when you became a couple. The heavens smiled upon you when you got married. Angels blessed you when you became parents for the first time. The gods themselves have showered you with blessings, as you have become parents yet again. Congratulations. 4) In the day and age when children are seen as a responsibility, it is wonderful to see parents embracing parenthood as a blessing. Congratulations for becoming parents again. 5) A second baby means double the cuteness, double the sweetness and double the happiness in your family. Congratulations. 6) The love of a newborn baby is pure, innocent and blissful. Congratulations for being able to experience it for the second time. 7) The beauty of giving birth is much realized in hindsight. Ask any old woman how she felt when she gave birth to her child and a beautiful smile will light up her face. Now you have two reasons to keep you smiling for a lifetime. Congratulations. 8) The feeling of having your newborn place its head on your chest for the first time as you cuddle its tiny fingers is one of the miracles of life. You are lucky to have experienced it twice. Congratulations. 9) Congratulations for giving birth for the second time. You are on your way to officially earn the degree Masters of Changing Nappies. 10) Your first child was your first step at becoming a mother and a father. Your second child is the final step in your journey to become a loving family. Congratulations. 11) As human beings, you both have so many qualities that it would have been impossible to for one child to inherit all of them. Now you can pass on some of those qualities to your second bundle of joy. Congratulations. 12) I feel happy that you have given your young daughter a little brother. But I am happier that you have given me an adorable nephew. Congratulations. 13) I officially declare you the strongest woman in the world to be able to tolerate the pains of labor and the sleepless nights that will now ensue, for a second time around. Congratulations to the new mommy. 14) The experience of raising your first child will help you giving your second child an even better childhood. Congratulations. 15) Damn, woman. You are so fertile. Congratulations. 16) Your firstborn may not realize this but with the birth of your second child, he has just been given the best form of friendship, support and lifelong love anyone can ever have – a sibling. Congratulations to the happy parents. 17) Congratulations for becoming a mother for the second time and thank you for making me an uncle to another cute toddler. 18) Just when I thought that your life was perfect, it became better. Congratulations for your second baby. 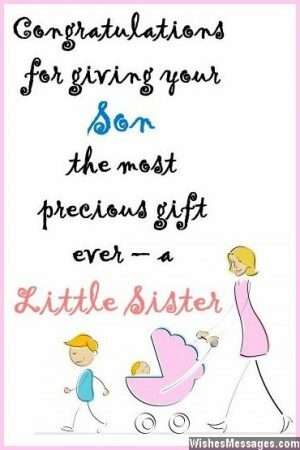 19) Congratulations for giving your firstborn child the most precious gift ever – a little brother. 20) You are different from all other parents because you are less of a nagging mother and more of a model human being that your children can strive to be. Your newborn is lucky to be born in the arms of such a wonderful parent. Congratulations. 21) If your first child is anything to go by, your second child is going to have the best upbringing ever. Congratulations to the best parents in the world. 22) Congratulations to the mommy for embracing motherhood and to the daddy for taking on fatherhood yet again. 23) Parenting is a full-time job. Congratulations to you and your husband for snapping up yet another role. 24) A second child is god’s way of saying that you both have been excellent parents to your first newborn. He wanted another baby to be born in the caring arms of parents like you. Congratulations. 25) Your first bundle of joy already arrived with your firstborn. With the arrival of your second child, your family has received tub loads of joy. Congratulations. 26) The beauty of becoming parents again is that you have experience by your side. Congratulations. 27) The concept of motherhood is so deep, that just having a child doesn’t make a woman a mother. But you have been such a loving and caring mom to your firstborn, that you had earned the right to call yourself a mother even before your second child was born. Congratulations. 28) Remember how your firstborn took up all your time and became the priority of your life? So don’t worry, it is not possible for the second child to take up any more time. Congratulations. 29) You already had the cutest child and now you have given birth to yet another cute toddler. How will you be able to handle this overdose of cuteness? 30) When you both got married, you became a lucky couple. When you had your first child, you became luckier. Now that you have become parents for the second time, you have become the luckiest. Congratulations.